There's probably no more sure-fire way to strike it rich than hitting oil and Texas Tea Slots adds a bit of petroleum speculation to the game of slots. Entertaining characters, a fun bonus game and high payouts make this game a winner. Texas Tea Slots contains symbols evocative of Texas itself. There are longhorn cattle, armadillos, the yellow rose, the blue bonnet and, of course, the tycoon who is known as Texas Ted. This game features animations and graphics appropriate to the theme and the images are crisp and easy to see. The top payout on this slot game is a Texas-sized 50,000 credits! Texas Tea slots may just end up getting the player enough money to enjoy the oil tycoon lifestyle themselves! There is no autoplay feature on Texas Tea Slots. This game, however, does contain various conveniences built into the interface to make game play more rapid. 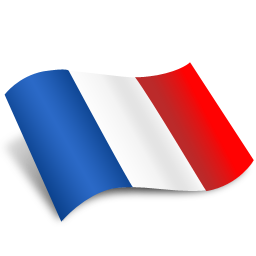 Players may increase their bet by one coin by pressing the appropriate button. Players may also increase their bet to the maximum by pressing the button with the appropriate label. Instant cash-out is among the other features of this game. 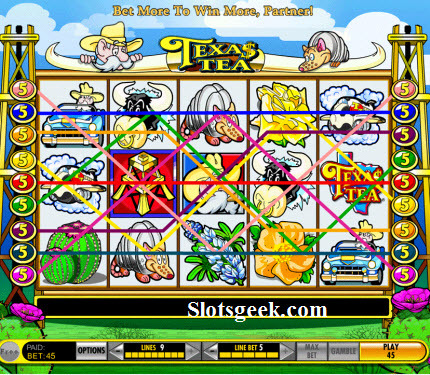 There are 5 reels and 9 paylines on Texas Tea Slots which can result in good payouts for the player. Betting on one line increases the payouts and betting on multiple lines places the odds more in the player's favor. One may bet on any set of consecutive lines and bet up to 5 credits on each line for a maximum bet of 45 credits for any one spin. The lines cannot be numerically out of sequence when placing bets. The selection interface for the lines illuminates the choices as they are made and allows the player to easily see what areas of the interface will net them a payout. Oil, of course, is all about dividends and, if the player is lucky, Texas Ted will cut them a check. Get three or more Texas Ted symbols on any active line and he'll write a check based upon the bet that triggered the bonus. More Texas Ted symbols means a higher bonus and higher bets increase the dividends, as well. Texas Tea slots does offer the opportunity to strike it big. If a player gets three or more oil derrick symbols on any line, they go into the bonus game. In this game, a map of Texas appears with different sections drawn on it. The player chooses which sections in which they wish to speculate and the oil pumps start to work. The more derricks, the more potential winnings, of course. This bonus game can net very large payouts. This game features some amazing event graphics, especially when one of the bonus rounds is entered. The machine starts to shake, oil sprays all over the screen and the player is delivered to the map where they can start trying their luck at striking it big in Texas with a little help from their oil derricks.